Mint and Mango both are refreshing and relishing dish for summer. So, while it comes to make any recipe with mango whether it is shakes & smoothie or any unique & innovative dish like Mango Almond Tart, every recipe has its own delicious taste which all mango lovers should try. 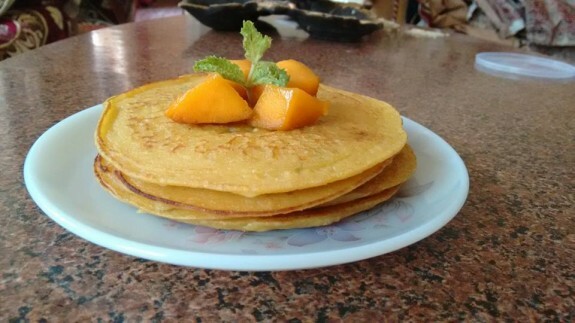 So, let’s start the day with this delicious and easy to make eggless mango mint pancake recipe in your breakfast. 1. Blend the Mango pulp, sugar and chopped mint leaves in a blender till its smooth. 2. In a bowl, combine flour and baking powder. Now, pour milk and mix mango pulp and mix everything well to form a smooth batter. You can also add water if required. Keep the batter aside for 5-10 mins. 3. Heat a non stick pan and smear butter into it. 4. Pour around d ½ cup of batter on the pan. Do not spread it too much otherwise the pancake will not be thick. 5. Cook on medium low heat for around 2-3 mins until one side is done. While you see small bubbles appearing on the top, flip the other side and cook for another 1-2 mins.